BLUE MERLE AND BLACK TRIs. They're all beautiful and very smart! and just being your best friend! Australian shepherds are beautifully colored with a wide variety of colors and patterns that never get repeated. We have all four colors, reds, blacks, red merles and blue merles. Eyes can be any pattern from blue (marbled, halves, striped, and dotted) to brown or amber. Their temperaments are an added bonus. They are loving, protective and willing to please. Their intelligence is astounding. The more you teach them, the more they want to learn. Our bloodlines are strong and sound. We do not breed any dog that rates less than OFA (Orthopedic Foundation for Animals) Good and are very selective when breeding to outside dogs due to issues of eye soundness and of course the issues of epilepsy and other prevalent genetic diseases now sadly permeated in this wonderful breed. Our dogs eyes are all cleared yearly and puppies at 7 weeks of age by veterinary Ophthalmologist, and now we do the MDR1 and the HC (hereditary eye cataracts) testing. Our dogs our extremely versatile. They will be eager to do whatever you ask of them. 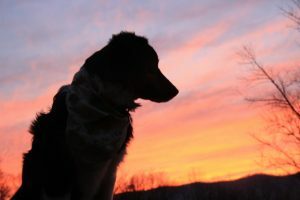 They excel in agility, herding, conformation, obedience and just being your best friend. We’ve even done Search and Rescue with one of our boys. He was ready for certification testing in less than 3 mos. compared to the normal 9 mos. of training, and accepted or “hit” upon cadaver scenting. Our dogs eyes are all cleared yearly and puppies at 7 weeks of age by veterinary Ophthalmologist, and now we do the MDR1 and the HC (hereditary eye cataracts) testing. Our puppies come from championship bloodlines. We are happy to share their heritage with you! The Aussies have always been the versatile, beautiful, loyal companions, dependable babysitters, and great ranch dogs that have made this breed so popular today. Australian shepherds are wonderful and can’t be beat! 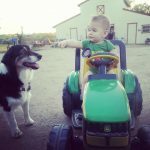 Caleb says: "There's nothing like the help of a good dog when there's work to do on the farm."